The rainy season has arrived. Stay dry with our one size fits all adult ponchos with plastic snap pouch. 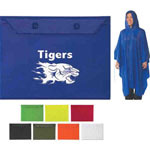 These durable and long lasting ponchos come in an array of colors and can be customized with your company name on them. Don’t let those April showers get you down when they come your way, stay happy and dry with our ponchos to bring in the flowers that come in May.